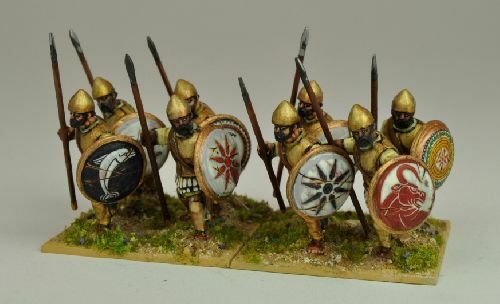 Citizen Spearmen in Cuirass x8. Figures are 28mm sized and cast in metal. Supplied unpainted. Spears and shields need attaching with glue. Figures are not supplied with spears. Painted examples are using wire spears NSS102. The shield transfers are by Little Big Men Studios and available from Crusader Miniatures. The plastic square bases are also available from Crusader Miniatures. Figures painted by EVM Painting service.